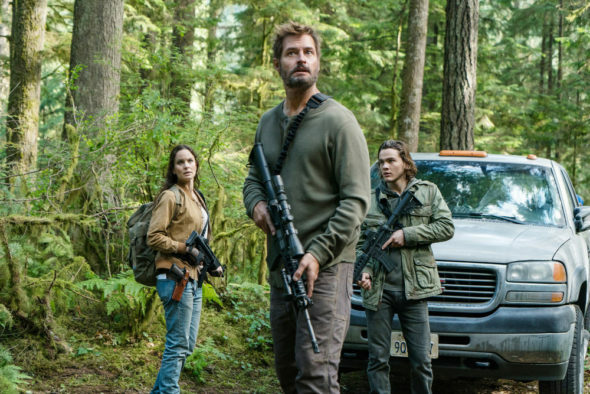 How tightly does the Bowman family stick together during the third season of the Colony TV show on USA Network? As we all know, the Nielsen ratings typically play a big role in determining whether a TV show like Colony is cancelled or renewed for season four. Unfortunately, most of us do not live in Nielsen households. Because many viewers feel frustration when their viewing habits and opinions aren’t considered, we’d like to offer you the chance to rate all of the Colony season three episodes. **Status update below. A USA science-fiction drama, Colony stars Josh Holloway, Sarah Wayne Callies, Tory Kittles, Peter Jacobson, and Alex Neustaedter. The story unfolds in the near-future, in a world where citizens are under military occupation by the Colony Transitional Authority, as part of a larger extraterrestrial invasion. Former FBI agent Will Bowman (Holloway) and wife Katie (Callies) were raising their daughter and two sons in Los Angeles, but were separated from the younger boy during the invasion and pulled out all the stops to get him back. The third season kicks off six months after the season two finale, with Will and Katie rebuilding their family in the world beyond the walls. They soon begin a journey during which they’ll uncover the truth behind the occupation. Once again, this family will find themselves having to choose sides. What do you think? Which season three episodes of the Colony TV series do you rate as wonderful, terrible, or somewhere between? Should USA Network have cancelled or renewed Colony for a fourth season? Don’t forget to vote, and share your thoughts, below. **7/21/2018 Status Update: Colony has been cancelled by USA Network. Details here. colony did not deserve such a half finale. I don’t want to watch other shows of people related to this show. We are very disappointed it’s been cancelled! This was consistently a high quality, intelligent Sci-Fi show with good acting. Come on, don’t cancel the good stuff! There are so many examples of bad shows out there that are similar that keep getting renewed. (Walking Dead should have been dead long ago) There should be a fan push to bring it back! I was very disappointed to hear it was cancelled. Hopefully someone will step in and make more seasons. There could be so much more! Usually shows get worse from season to season, but for this show its opposite. Season 2 was better than 1, season 3 was better than 2. I really hope this is not the end for this show. I can’t believe such a great show was cancelled! Its got a multi-layer plot and is a real eye opener for anyone with a sense of history – the whole totalitarian/collaborator thing can so easily happen and is so difficult to work against as we see in the dilemmas that the Bowman family faced. I can say that this is the best Scifi show I’ve seen. Now just have to sit on a cliffhanger and hope Amazon or Netflix step in to finish it properly. This show has ABSOLUTELY been BY FAR one of the greatest, it better return for another season. Josh Halloway & Sarah Wayne Callies are two of my favorites, always have been. They r both beyond great in colony including many other’s movies, t.v series. These two as a family in the show, show all the fans how families are stronger together rather than apart, but to never give up!!! The ratings for this show is waaay more than 10 stars. Colony is one of THE best TV shows out there. Please give us a season 4! Exceptional show. One of very few sci-fi shows that models war-time societies (collaborators vs rebels). Put a real lens on things. Also, great acting. Great stories. One of the few shows we actually watched as a family. Maybe a bolder network could pick it up? Netflix? Amazon?? Terrible decision. I really enjoyed the show on multiple levels e.g. storyline, characters, drama. It’s also a cop out to cancel on a cliff hanger. Save #Colony. This season was mad and I was hoping that it would be renewed. Love Colony. Would really like it to be renewed. I can’t believe USA has canceled a Top Notch show like Colony. It’s one of the very best Series on TV. Quality acting, quality writing, and an amazing story line. What is wrong with you people??? Just for once, don’t make it about “Ratings”. It doesn’t have to be.